Book-reading, life-(sort of)loving grad student living in Boston. My good pal Lindsey and I are still blogging (sporadically) at The Things We Eat. Read more about my stupid dead dinner and other random food-related tidbits at mah food blog! 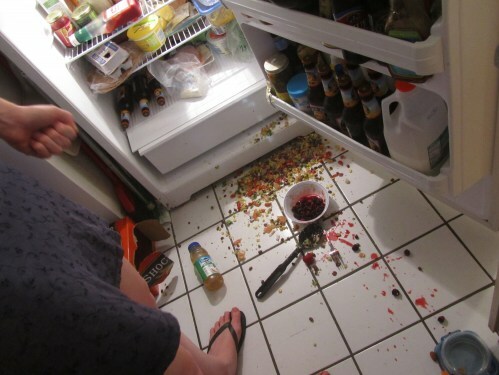 and I upset the salad bowl while trying to fit more Harpoon Cider in the fridge. Did I mention it was a Tuesday? Not to mention the entire bottom and side of our fridge is stuffed with beer. I think this is our fridge’s cry for help…. If you take out more of that food, you can get more beer in.